There is ongoing tightening up of regulations that impact upon industries where the monitoring of measurements of illuminance, temperature, atmospheric pressure, humidity and CO2 is critical in the manufacture and storage of electronics, pharmaceuticals, frozen foods, comfort conditions in buildings and other temperature sensitive applications. This is making South African industry take a new look at how accurately its processes are monitored. To ensure that temperature spikes outside of accepted parameters are recorded and acted upon immediately Delta OHM is offering the HD50 Web Data Logger instrumentation. The HD50 is a measuring device that stores data in a memory that can be located locally in the instrument, in a database on a PC or server, or in the cloud. The HD50 was developed for use with one logger, which can be extended to an unlimited network of loggers. Settings can be opened from a Web browser, as it has a built-in Web server. This way it is also possible to monitor the actual measurements. Delta OHM already has the HD35 series, based on RF communication. In some cases when networks are very wide or complex or divided into more than one building, a mix of cabled, WiFi and radio frequency loggers can be the best solution. The HD50 series can be integrated into such hybrid networks. “Apart from easy-to-use Web browser access and the ability to be applied as a stand-alone or linked to numerous networks with hundreds of loggers, the HD50 can support practically any signal. Universal inputs make it possible to integrate any transmitter with standard output,” says Jan Grobler, managing director of GHM Messtechnik South Africa. “Additional software is available for all solutions: database locally on PC, database on local server, or cloud based. We also offer optional software for CFR21part11, utilised in the pharmaceutical market. The HD50 has a wide range of standard sensors (°C / RH / LUX / Atm / CO2) and the logger sends an email alarm when a value is higher or lower than the set threshold,” he adds. 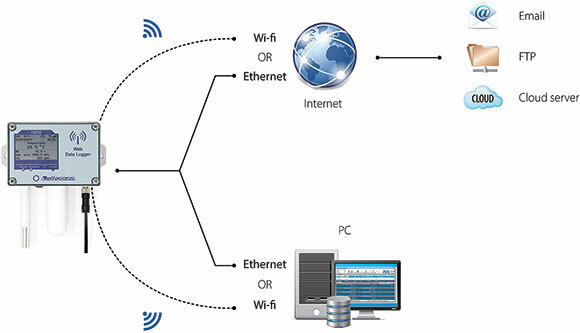 Connectivity: The Web data logger can be connected to a local network either via WiFi or Ethernet interface. Logging: A measurement and logging interval can be set up inside the data logger. When the data logger memory is full, it can be selected to stop the logging or to continue overwriting the older data (cyclic logging). It is possible to log all the available quantities or, in order to increase the memory capacity, only the quantities of interest. Alarms: For each detected quantity, two alarm thresholds can be set. The exceeding of a threshold is signalled acoustically by means of the internal buzzer, visually by lighting the alarm LED on the front panel and remotely by sending alarm emails. An alarm hysteresis and a delay in the generation of the alarm can be configured for each detected quantity. Integrated Web server: The integrated Web server allows configuration of the data logger and view real- time measurements from any PC, tablet or smartphone. Connectivity to the same local network of the data logger is by simply using a Web browser and typing the IP address of the data logger, without the need to install specific software. Measurements can be seen in the form of a graph or in a table. Cloud: The integrated Web server can connect data directly to the logger and display the actual measurement. The data logger automatically sends the data to an HTTP server at regular intervals, and in particular to the Delta OHM portal, www.deltaohm.cloud. The data sending interval is configurable. One of the unique features of the HD50 Web data logger is its ability to store variables accurately and effortlessly. The data logger can be applied in any industry requiring measurements over time. “Reliability is what the Delta OHM HD50 Web data logger instrumentation offers. It has the latest available software, giving the HD50 the edge for absolute accurate measurement readings,” concludes Grobler. GHM Messtechnik has appointed Flippie Botha as sales engineer.